5D ALSO MEANS LESS MURDER! 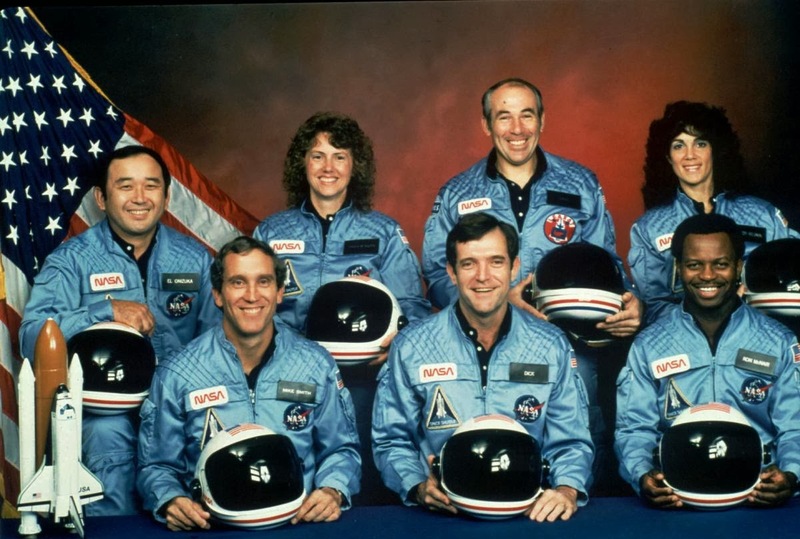 SPACE IS OUR DESTINY: A TRIBUTE TO THE CREW OF THE SPACE SHUTTLE CHALLENGER! Twenty-eight years ago today, January 28, 1986, the space shuttle, Challenger, blew up during its ascent, killing everyone onboard, including teacher, Christa McAuliffe. As a lifelong believer in the potential for the human race to eventually become part of the galactic community by reaching out to the stars, I felt particularly affected by the event, and even more so because people began claiming that human beings had no business in outer space. In fact, I felt so moved to speak out on the need for humans to explore the galaxy that I wrote an open letter to President Ronald Reagan volunteering to be the first person from the social services profession to fly on a shuttle. The letter, in edited form, was published in the New York Times. ADDENDUM TO: "NOBODY NEEDS ME! (HATING WAR IS NOT THE SAME AS LOVING PEACE!)" Last spring I began my series, "The Truth About Everything," and one of the 10 Truths was entitled, "Nobody Needs You!" Well, I am discovering for myself that when it comes to politics and social evolution, nobody needs me! When I began this blog in 2007, in addition to the psychological and metaphysical understandings that I wished to impart through FPL, I also used the blog as a forum for commenting on what was happening politically in the country as the energy was building up for the upcoming 2008 presidential contest that would eventually lead to the election of Barack Obama. By 2010, I pretty much stopped using FPL for that purpose, feeling called to devote my posts to the Wave leading up to the end of 2012 and the raising of consciousness as we approached the great transition of 2013 and beyond into 5D. Well, I have a confession to make. I continued to indulge my fascination/attachment to things political by posting anonymously on the craigslist politics blog, a repository of very low vibrations indeed (I won't even put a link!). At first, I thought I was offering an antidote or counterbalance to the very extreme mentality there. By the middle of last year, however, I realized that I was "hating war instead of loving peace," and (a.) not benefitting or changing anyone there, and (b.) that the endeavor was creating toxicity in me. So, I created my own program of detoxification and consequently, I have not posted on said blog in well over 4 months. Almost immediately after I stopped the posting on CL, two things happened: (1.) I began to see how - without my help - the energy of low vibrations and the forces of fear, hatred and general negativity were imploding with all due speed on their own in our society at large in 5D, and (2.) I freed up my energy to do more gratifying and creative writing at a vibration more aligned with my Higher Self. As a result, I finished an episode of the second season of City Rock, and started writing more extensively on my FPL blog and in my own personal journal much more. Never underestimate the need to honor and protect your vibration and energy field, folks. Hating anything, battling anything, fuels and energizes the very thing you hate and battle, and keeps it glued to you. Embracing, accepting and loving everything does not mean that you have to engage in the lower self vibrations of others. It just is the truest, fastest, and basically only way to transform anything... by transforming yourself in love. P.S. THIS was the headline of a news story in the NY Times yesterday by Frank Rich: "STOP BEATING A DEAD FOX" On the Huffington Post today it read: "FOX NEWS DYING!" "BECKI" LIKES PL'S POST ON "LOVE AS THE MAJOR CREATIVE FORCE IN 2014"... AND SHE LIKES HIS TABLE! Your table is gorgeous, btw!" Thank you, Becki! Can't wait to polish it this weekend! Yes, although an earlier post pointed out that the death rate is going up, the murder rate is going down. This is from a piece entitled: "The Year in Murder: 2013 Marks a Historic Low for Many Cities," on The Daily Beast website. America, led by New York City and Philadelphia, is reportedly on track to have its lowest murder rate in 4 decades. Death rate going up, murder rate going down? Yes. Because it's 5D, those who cannot maintain the higher vibration are leaving the planet, as we are coming to know it, in greater numbers, but also because it's 5D, they are not leaving through violence as often. HAPPY NEW YEAR! "MIRACLES ARE THE RESULT OF NATURE UNIMPEDED!" That is one of my favorite channeled quotes. It says something so important and so counterintuitive to a 3D mentality. Exactly. The "Zone," as we've called it, is that place we enter when we “get ourselves out of the way,” or more specifically, when we get our ego, self-will and Resistance out of the way. In this year now begun, in this moment, you will find it quite easy to witness miracles. Synchronicity, serendipity, meaningful coincidences... all you'll have to do is look around. If you miss them, it doesn't mean they're not there, not happening, it means you're choosing to ignore them. It means you're still hanging on to Murphy's Law, which has been reversed in 5D. One answer is a variation of what Baggar Vance is saying, which is to get out of your head, out of your obsessive, thinking mind, and follow your body, follow your five senses, along with your sixth sense, your gut instincts, your first impulses, the callings in your heart. We all have them, but we have trained ourselves to ignore them, to hesitate, second guess, over-think, calculate and calculate, and so, we miss the opportunities, the messages, the assistance, the bounty and the booty! There is a great gift inside each of us waiting to come out. No one is without it. Some souls have chosen to give us a demonstration in one particular area or another, but examples are all around us... and within us. Seek them and you will find them. Try this: walk around and pay attention to what you see, hear, smell, taste and feel, not to what you’re thinking, which is usually what you’re always doing. Go ahead. Go out. It’s a beautiful day. Walk. Give yourself, and the world, your gift. We’re waiting for you!